The relationship between law and religion has traditionally been analysed according to two basic paradigms. One has focused on the relationship between religious communities and the State (the Church/State paradigm), while the other has concentrated on the relationship between the State and the individual (the liberal-individualist or civil liberties paradigm). 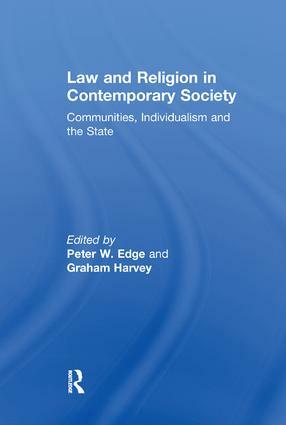 This book enriches the analysis of law and religion in society by emphasising a third and complementary analytical dimension involving the relationship between religious communities and religious individuals. In particular, the contributors explore the various facets of the multiple tensions that exist in the legal relationships between religious organisations, State and adherents in the period leading up to the third Christian millennium. Against the background of the complex and sometimes contradictory responses of religious organisations and the State to the Human Rights Act, this interdisciplinary collection draws on contributions from leading scholars active in the field of religious rights and the interaction of law and religion based in the UK, USA, Canada, New Zealand and elsewhere, and makes a timely and significant contribution to international debates in a variety of academic disciplines. Contributors explore international concerns over religious liberty, focusing particularly on the boundaries of ethnicity and religious community, the status of the 'established' Churches in the UK, and the proper place for religious organisations under generally applicable legal regimes of non-discrimination. Themes discussed are closely related to wider interests within legal and socio-legal studies involving gender, discrimination, equality, community and the nature and limits of individualism and individual legal rights. Neutrality between Religions or Neutrality between Religion and Non-Religion?